Stir cookie mix, flour, butter, egg and soft drink mix (dry) in medium bowl until dough forms. Roll dough on floured surface until about 1/4 inch thick. Cut dough with round cookie cutter. Place 1 inch apart on ungreased cookie sheet. To decorate before baking, for eyes, nose, mouth and ears, use hard candies (not chocolate) or decorating gels. To make hair, push scraps of dough through garlic press OR use plain or tinted flaked coconut (coconut will toast during baking). Bake 7 to 9 minutes or until edges are set and golden brown. Cool 1 minute before removing from cookie sheet. Cool completely, about 30 minutes. 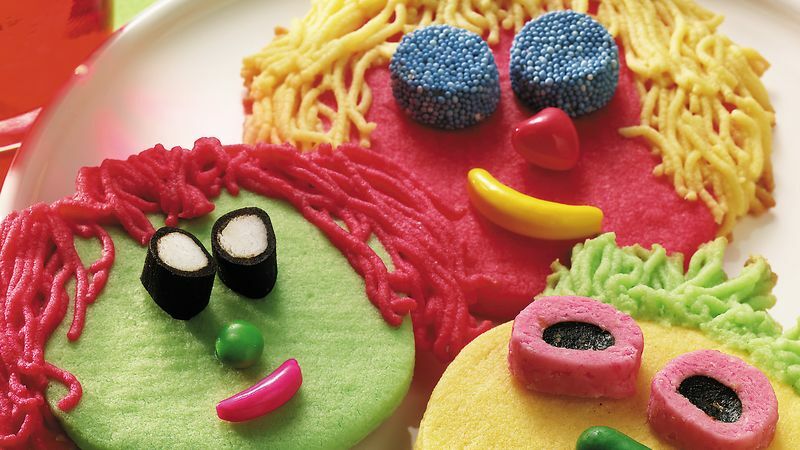 To decorate after baking, for eyes, nose, mouth and ears, use a variety of candies, decorating gels, frostings, miniature marshmallows, chocolate chips and licorice. For hair, use gels, tinted coconut, candies or pieces of fruit leather. Do not stack cookies decorated with gels. Single flavors of soft drink mixes (such as strawberry) will give a brighter-colored cookie than blended flavors (such as strawberry-kiwi). To minimize melting of candies and gels during baking, place cookie sheet of decorated cookies in the freezer for 10 minutes before baking. The baking time will not change. To Make Hands and Feet: Cut dough with hand- and foot-shaped cookie cutters. Place 1 inch apart on ungreased cookie sheet. Bake 7 to 9 minutes or until edges are light golden brown. Cool 1 minute before removing from cookie sheet. Cool completely, about 30 minutes. Paint on nails using decorating gels; sprinkle decors over gels for confetti. Use gel as glue to attach candy for toe or finger ring, or use gel to draw ring.